« Announcing the new Otaku News Central website! Editor’s note: Unfortunately, I was not able to complete my daily reports while at-con due to a very nasty hard drive crash on my laptop. The good news is that no data was lost. The bad news is that this has delayed my reports until I could come home and fix things. I’ll post the final Day 3 report (sadly we didn’t make it to Day 4) shortly, and we will of course be getting together, probably this weekend, to record a FanimeCon recap and review podcast episode. Day 2 of FanimeCon got off to a bit of a shaky start as I didn’t make it on site until early afternoon. However it got busier from there. Unfortunately it also started on a bit of a sour note, as once again the SJCC was being heckled to death by a group of fundamentalist Christians. This year they were equipped with a megaphone and, to be brutally honest, were really annoying. The crowd was putting them in their place though: if, for example, they would proclaim that we would all burn in Hell, the crowd would shout in unison “YEAH!! PARTY TIME!! !” or something like that. Apparently they are standing just beyond the edge of convention center property and so are avoiding legal prosecution. Or something like that. Personally, my instinct is to go up there and argue with them, but then I realize that that is exactly what they want. I think what would really get these guys is if we completely and utterly ignored them. Don’t answer them, don’t look at them, just pretend that they just don’t exist. 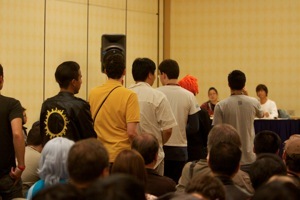 FanimeCon does a really commendable job of giving plenty of “face time” with the Guests of Honor. Each GoH had at least one focus panel, with many guests hosting two or more panels, focused on different areas of their work. In addition there were plenty of autograph opportunities (many GoHs had two or more autograph sessions as well). Also I saw many guests wandering around the con in general, and they were almost always willing to stop and chat with their fans, pose for pictures, etc. This can only happen at less corporate, more fan-oriented cons such as this. Most of the following updates are a bit short on details. Blame that on me not taking any notes (ie: Notetaking FAIL). I did however record the panels so as soon as I get home I’ll be able to review the panels, and will summarize them when I record our inevitable FanimeCon 2011 recap podcast episode. Our first panel of the day was Mamoru Yokota, an illustrator, character designer and producer who worked on several projects including Air (movie), Kanon, and Death Note, among others. 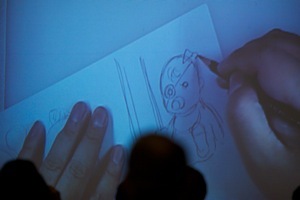 He amazed the audience with his drawing skills, and also spoke of what it’s like working in his field. We next caught Tohru Furuya’s panel. Mr. Furuya is a veteran voice actor and is probably best known as the voice of Amuro Ray in the original Gundam. In addition he has provided voices for Pegasus Seiya (Saint Seiya), Yamcha (Dragonball Z), Kyosuke Kasuga (Kimagure Orange Road), and Tuxedo Mask (Sailor Moon). He was really energetic and totally “clicked” with the audience, and entertained us with voices from his various roles, as well as tales of what it’s like working in the industry alongside other notable figures. The fans really loved him – the line to ask him questions was really impressively long. One fan in particular wanted to express her love of his works by offering him a hug, which he bemusedly accepted. Seiji Mizushima’s panel was next. 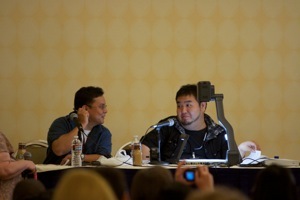 He directed several notable works, including Slayers Next, Shaman King, Fullmetal Alchemist, and Mobile Suit Gundam 00. He seemed a bit more reserved than the other panelists we saw today, but still informed the audience with tales of what it’s like working in the anime industry. Then came the highlight of my evening (and I’m sure it was also the highlight of quite a few FanimeCon attendees’ evenings as well) – Momoi Halko’s panel. She is a prolific idol singer, voice actress, and self-proclaimed otaku and “Queen of Akihabara.” To see someone not only acknowledge her otaku status, but positively revel in it, is refreshing indeed. She is cheerful and energetic, and is truly grateful to her fans and makes every effort to stay in touch with her fan base, and it shows. She made every effort to answer everyones’ questions, and seemed genuinely apologetic when she had to cut peoples’ questions short on account of time. When asked about her observations on the differences between anime fandom in Japan vs. here in the US, she commented that the anime convention scene between the two countries is quite different, and that in Japan, they don’t have the proliferation of fan-run events we enjoy here in the west (such as FanimeCon). This really impressed her. We were going to try and make it to MusicFest, the big music event at FanimeCon, but weren’t able to. MusicFest was held at the San Jose Civic Center to a sellout crowd — lines to get in to the event were out the door. Musical guests FLOW and Yuya Matsushita rocked the house. I was worried that Momoi Halko would also be performing at MusicFest and that I would miss her. Fortunately my worries were unfounded, as it turned out that she would be performing in her own concert the following day. One of the reasons why we decided not to stick around for MusicFest was that the weather had suddenly turned ugly. San Jose got hit with a sudden off-again-on-again rainstorm. Unfortunately this caught people during the busy dinner hour, and tons of cosplayers were hurriedly scrambling for the nearest awning or overhang. Sadly quite a few costumes and props were damaged in this freak phenomenon. The only consolation was that this didn’t happen on Masquerade night, so people had a chance to fix their costumes. Word to the wise cosplayer: come prepared. If you don’t have an umbrella, then at least bring something that you can use as an umbrella (large fan, shield, I dunno), as well as backup cosplay items, costume repair supplies, etc. Anime Los Angeles definitely wins in this category, as they have a staffed Costume Repair Station open during con hours where people can effect repairs in times of need. One thing I noticed as we left the downtown San Jose area is the sheer number of congoers still out and about even at such a late hour. FanimeCon is truly a 24-hour convention: there is literally something going on at each and every hour of the day. This is one really good reason why you should really consider staying at a con hotel — the public transportation system shuts down after about 9 or 10. There were some events I really wanted to attend but the only way I could have done so would be to stay all night and beocme a con zombie (which, trust me, you really don’t want to do). Speaking of zombies, one of the late-night events I had to miss was the “Anime Convention of the Dead.” This fan-run event is based on the highly popular manga (and now anime) Highschool of the Dead. They asked for volunteers to come get “zombified”, which consisted of receiving (free) zombie makeup as well as “Training of the Dead” – how to be an effective zombie. The zombie hordes were then turned loose on an unsuspecting convention center. Really a cool idea. If anyone was able to get pictures and/or video of this, we’d really love to link to it. Get in touch with us! That about does it for this update. Tomorrow’s going to be a big day – not only is it the day of Momoi Halko’s concert, but it is also masquerade night. Stay tuned!